Two southern Iowa couples, who refer to themselves as the "Hog Hut Friends," are splitting a big Powerball prize. Iowa Lottery CEO Terry Rich presented them with a check this morning. 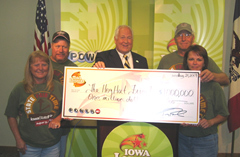 "On behalf of the Iowa Lottery, I’m pleased to present the Hog Hut Friends with a check for one-million dollars," Rich said. Rick Hamilton and Sharon Sulser of Chariton and Vickie and Terry Chambers of Columbia are camping together at the Iowa State Fair. Rick bought the ticket during a stop at a Pleasant Hill gas station to pick up ice. He noticed the ticket was a winner after checking the numbers Thursday afternoon. "My knees went weak, I lost my breath and got dizzy," Hamilton said. "(Sharon) wouldn’t believe me…nobody’s believed us yet." The long-time friends had always agreed that if one of them won a lottery jackpot, they would split the money. The "Hog Hut" is the couple’s local motorcycle hang-out. Hamilton insists the money won’t change their lives. "It’s not going to change us, it’s just going to make life a little easier for all of us," Hamilton said. In fact, both couples plan to keep camping at the Iowa State Fair through the weekend. "Everybody’s welcome to come up and have a cold one with us if they want," Hamilton said as the others laughed. After taxes, the four individuals will split $700,000. None of them were sure what they might do with the money. "Anything is possible, but I think we’re just going to put it in a bank and then just sick back and think about it for a week or two before we do anything silly," Hamilton said. The two couples originally tried to claim their prize on Thursday at 5 p.m., but the Iowa Lottery offices had just closed. "I had my face up against the window there, I saw a light was on and I got somebody’s attention," Hamilton said, laughing. A lottery employee urged them to call a financial advisor and return in the morning. Hamilton, 55, is a retired U.S. Department of Veterans Affairs employee who now runs his own soil sampling business. His partner, 51-year-old Sulser, works at the Hy-Vee in Chariton. Vickie and Terry Chambers are both 50 and operate a farm in Columbia, which is located just south of Knoxville. The couples said they’d won much smaller Iowa Lottery prizes in the past. "Well, these three always call me lucky," Hamilton said. "I keep telling (Sharon) she’s the luckiest person alive." As everyone laughed, Sharon responded, "As long as he keeps on winning, I am." The couple’s winning ticket matched five numbers during Wednesday’s Powerball drawing, but missed the red Powerball for a $200,000 prize. Hamilton choose the Power Play option, which multiplied the prize to $1 million.